Well, the quick answer to this question is not much. The only stock that I have strong conviction at this point is MasterCard (Ticker: MA). This stock has been acting strong relative to the overall market and continues to go up in a declining market. Once the market starts to rally, this stock will fly. I'm looking to reallocate more $$$ into MasterCard. 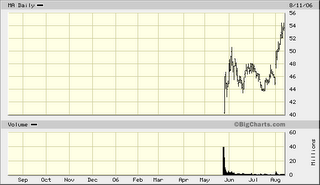 All of the companies in my portfolio have reported and the only disappointment is Invitrogen (Ticker: IVGN). I'm looking for this stock to retest its recent lows around $56 and that's when I will add to my position.